Late on a hot summer night in the tail end of 1965, Charlie Bucktin, a precocious and bookish boy of thirteen, is startled by an urgent knock on the window of his sleep out. His visitor is Jasper Jones, an outcast in the regional mining town of Corrigan. Rebellious, mixed race and solitary, Jasper is a distant figure of danger and intrigue for Charlie. So when Jasper begs for his help, Charlie eagerly steals into the night by his side, terribly afraid but desperate to impress. In the town of Corrigan, a knocking breaks the silence of night. Town pariah Jasper Jones is outside Charlie's window, frantic, desperate and with a secret that will devastate the community. Thirteen year old Charlie knows Jasper only by reputation, his father's alcoholism and rebellious notoriety, racism thinly disguised as small town prejudice due to Jasper's Indigenous mother. While navigating Jasper's circumstances, Charlie begins to observe the injustices of Corrigan. The racial torment his best friend Jeffrey Lu endures as he is determined to play cricket for the small community, why his mother is so abrasive and unnecessarily stern, Eliza, the town recluse Mad Jack Lionel and Jasper, a boy who under devastating circumstances, has taught Charlie to live. Jasper Jones is an honest portrayal of the nineteen sixties in small town Australia, confronting, compelling and captivating. The Community of Corrigan is a charming town, they're passionate about their sporting prowess, upholding the law and being pleasant to their neighbours. As long as your neighbours are white. On a warm Australian summer night, fourteen year old Charlie Bucktin walked through Corrigan with sixteen year old Jasper Jones, his innocence and naivety abandoned to the night. How strange and abandoned and unsettled I am. Like a snowdome paper weight that's been shaken. There's a blizzard in my bubble. Everything in my world that was steady and sure and sturdy has been shaken out of place, and it's now drifting and swirling back down in a confetti of debris. Jasper Jones is a quiet, intelligent, part Indigenous Australian young man in a predominantly white town. He's treated as an outcast and the harbinger of disorder, culpable for crime and leading their youth astray. Since losing his mother, his alcoholic father had abandoned the family home and his son, leaving the sixteen year old to fend for himself. Jasper's discovery is sickening, incredibly confronting and violent but imperative to the narrative. Charlie is young and charmingly naive. His mother is verbally abusive and acidic, frustrated at her life cemented in small town Australia. His father, a local teacher and a strong advocate for the written word. Charlie's father is a kind and gentle soul, withstanding the vitriolic attitude of his wife. His love of words has encouraged Charlie to read and aspire to become an author himself. The town of Corrigan is fueled by racial tension and exclusion during the Vietnam war era, experienced by Charlie's best friend Jeffrey Lu and his family, having migrated by Vietnam. Jeffrey was a wonderful friend to Charlie, supportive and endlessly amusing. The racism and cruelty that the Lu family faces was deplorable. The casual bullying by the local cricket team that Jeffrey was so desperately seeking inclusion, the physical and racial verbal abuse by teens and complacent adults was nothing short of disgusting. Jeffrey was inspirational, determined to prove his sporting worth despite his small stature. 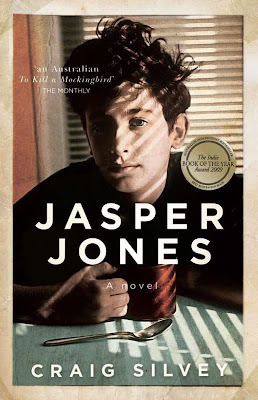 Although the community mentality has begun to progress, Jasper Jones is confronting, especially for those who have experienced violence, racism or prejudice, although Charlie's white narrative tends to obscure the explicit nature for the teen audience. An important fictional narrative of Australian history. Oh oh I really want to read this one! I saw the movie trailer and I was all 'WHY HAVE I NOT HEARD OF THIS" and so I'm definitely going to library it...ya know. Eventually. When my TBR isn't strangling me.😂 I'm really glad you liked it!! Definitely read the book before seeing the movie though, it's absolutely captivating. Wow this sounds so good and so important?? Why haven't I heard of this before?? Wow, I'm so glad you just changed that...It's on my Tbd the now and hopefully I'll be reading it soon! Thanks Sam. It was published quite a few years ago but it's been made into an adaptation only recently. Looking forward to seeing it now that I've read the book. It was truly brilliant. This sounds like a very important read. It's horrible how awful people can be to one another, and I hate that not much as seemed to change. Thanks so much for sharing. It truly is Lauren, how racism was so casual in sixties Australia and the treatment in small country towns especially. It's quite a popular Australian book, I wish I had of bought a copy so much sooner. Amazing read and now looking forward to seeing the film adaptation soon. I bought this one when I first heard about it off an English teacher I know. That was back in 2012 and I still haven't read it yet *hangs head in shame*. I've seen the trailer for the movie adaption popping up all over the net, looks good. I really need to move this one further up my TBR and FAST!! Most definitely before you see the film Sarah. I had this one on my reading list for so long and I wish I had read it sooner. It was completely different to what I thought it would be and really surprised me. Do you believe I haven't read this, but have a review copy to read now and I really must do so. I didn't know what it was really about - other than having heard good things... so when it was being re-released for the movie I realised I should get a copy! I wasn't aware it was more than a contemporary either, but also a mystery. it was absolutely amazing and stayed with me long after I'd finished. I would love to see what you think of it. Wow. I've seen so may people reading it on my train ride to work this past week and wondered about it. It sounds captivating, powerful and sometimes it sounds like it might've been hard to read too? It's most certainly confronting Verushka, especially the mystery element to the storyline. Such a powerful read. well i am curious to know what secret poor Charlie has seen. isn't it around the stolen generation too? The stolen generation isn't mentioned or featured in this one Ailyn, but Jasper is such a wonderfully brilliant character. This is as much his story as it is Charlie's. Fantastic review. You hooked me in without giving anything away. Adds to TBR list! I can't wait to see what you think of it Karen. The wonder of Jasper Jones is discovering what happened as the storyline progresses. Just reading the review has me blown away. To read a book that confronts racism and prejudice so, so well? That's gold. One of the best functions of fiction I think is to expose the social problems we all carry and partake in. Jasper Jones sounds like it does this perfectly. It really does. Not only the racism Jasper experiences as an Indigenous teen, but also Charlie's best friend Jeffery who is Vietnamese, taking place during the Vietnam war. Powerful reading. I keep hearing about this book lately (I guess because a movie is coming out)? Although I did know it existed before that, I've just not read it (story of my life lol) it sounds like a great read though. When I was working one of my temp jobs a zillion years ago, my role was typing up stories people sent in of 50s/60s Australia. It struck me how white it all was; I read about plenty of immigrant families, but they were all European. This reminded me of that for some reason. Back in the fifties, it basically was just European migration, which is when my mother migrated to Australia. It was very much the white Australia policy. It's such a brilliant read, I think you'll really enjoy this one. I put this book on my tbr-list long time ago, but totally forgot about it. Wonderful review, Kelly!